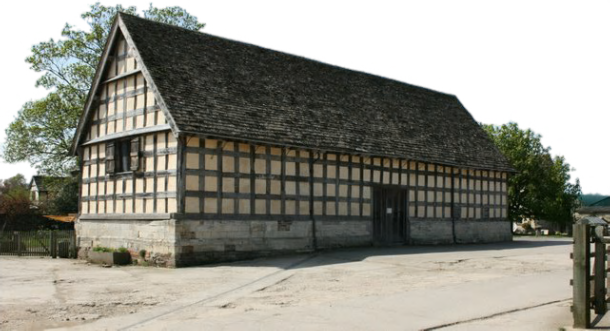 The wool barn at Frampton on Severn was built to store fleeces before they were shipped down the River Severn. At that time a creek from the river came down as far as the village green so the fleeces could be transferred directly to the boats. The barn is a very fine box frame structure with wattle and daub infill. The barn is orientated north-west south-east and there is a large wagon porch on the south-west side. Inside there is a half floor in the north-west end, presumably to increase storage capacity. You may visit the barn by arrangement or during office hours.